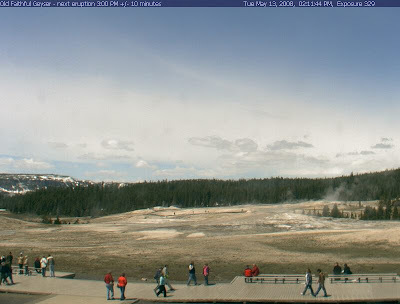 This is our third visit to Yellowstone. Of course our other trips to Yellowstone were during the summer when the boys were out of school. Twice we made reservations for an “off season” trip to Yellowstone, but both times we had to cancel because important projects came up at work. We had always planned to do an after Labor Day trip, however since Yellowstone is “on our way” from Arizona where we spent most of winter and Alaska where we plan to spend the summer, here we are. 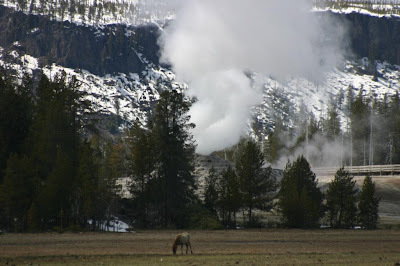 Today we went to the Old Faithful section of the park. 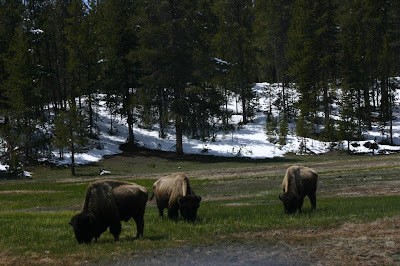 The park was perfect today with the snow everywhere, temperature in the 50s, Elk and Bison wandering across the road and in several locations. Birds including Mountain Bluebird, Osprey, Bald Eagles, Dark-eyed Juncos and Townsend’s Solitaires fly around. There was so much going on and places to stop, that we only had stopped at a couple of the thermal features today. It took us two hours to travel 35 miles. We had been told by two different people that there has been a wolf hanging out near Madison Junction. When we arrived there today we saw someone with a spotting scope. 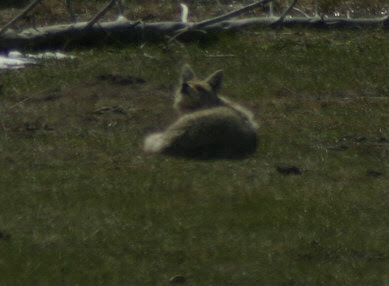 I put my scope on the spot he was looking at and there was a coyote sunny itself. So we will have to keep looking for wolves. 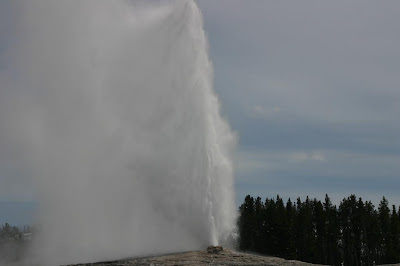 While waiting for the next eruption of Old Faithful, Kathy called our son Tim, who lives in Chicago. 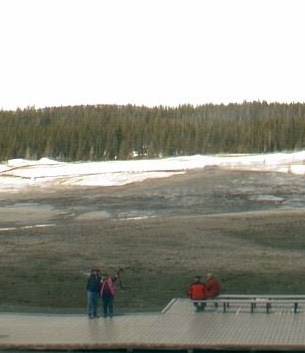 He was able to take a picture of us from 1,400 miles away as we waved to the Old Faithful Web Cam. It is amazing what you can do with the Internet. We are in the middle of the above picture. Kathy is wearing a pink vest. Wow! I spent some tme time with your Alaskan travels and I want you to kjnow how impressed I am with your commentary and the pictures. You are both literay giants. I am thrilled to look at the blog, which, I have never really been involved with. Belive me, I will periodically check your blog, so i can keep up with the both of you. Thanks for sharing your wonderful adventures.